Singletree, Inc. was established in 1976 by Paul Reeves, who has been designing and making quality crafts for over 35 years. Living and working in England, Ireland, Portugal, and now living in California, he works directly from ancient and historical design sources to create original designs and a timeless feel. 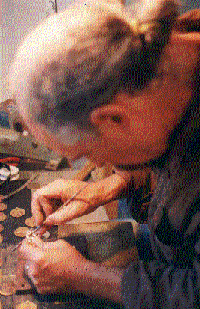 The unique etching process developed by Paul, while living in Southern Ireland, enables him to transfer the most intricate designs into silver, bronze and other alloys. Paul's work has been admired and purchased by the Art Institute of Chicago, M.H. de Young Museum, York Archeological Trust, Greenpeace (UK), the British Museum and countless other retail outlets over the years. Singletree, Inc. designs and manufactures a variety of products including fine quality Celtic flasks, tankards, pins, chokers and bracelets. Also, Singletree, Inc. manufactures and holds the US patent 5,878,755 on the unique and popular hairspiral™.